Over 600 people attended a Cuba Solidarity Campaign (CSC) organised memorial evening for the late Fidel Castro at London’s Congress Centre on Monday evening. 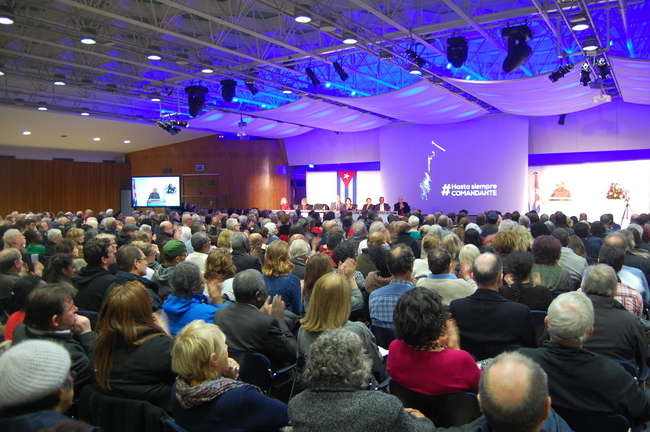 Due to overwhelming public demand and high registration numbers, CSC changed the venue just days before the event to the Congress Centre to accommodate the huge numbers of guests - and still there was standing room only, demonstrating excellent international solidarity with Cuba in Britain. The tone of the evening was one of remembrance – and celebration - of the contribution that Fidel Castro had made in Cuba and internationally, with Cuba’s internationalism in Latin America, the Caribbean, Africa and Asia recognised throughout the evening. Speakers included ambassadors, Members of Parliament, authors and journalists who gave moving speeches in addition to poetry readings, music and film. The Cuban national anthem was played the begin the evening and a minute's silence was given in memory of Fidel. “Those who die fighting for life cannot be called dead. Fidel will continue to live; in the faces of the children who go to school, in the sick whose lives are saved, in the workers who own the fruits of their labours." “Our America faces new challenges – perhaps bigger challenges than you faced during 70 years of struggle. Today the people of our America are more united than ever. Never lying nor betraying your moral principles, of this deep conviction. The Ambassador ended with “Viva la revolución! Viva Cuba! Viva Fidel!” and received huge a standing ovation. Writer and historian Tariq Ali said, “What do we learn from Cuba? We learn patience. We learn don't give up. How many times has the West written off the Cuban Revolution? "In our hearts you will live forever and the Cuban Revolution will last for a long time. We will never forget you. Hasta la victoria siempre! ", he said. Culture has been at the heart of the Cuban revolution and musical contributions and poetry readings added to the atmosphere of the evening. Cuban violinist Omar Puente said "Gracias a Fidel" before giving a touching musical tribute to the Revolutionary leader. Later in the evening Asabi Hawah sang a moving version of ‘Hasta La Victoria’, a song from Dr Denise Baden’s Fidel the Musical. Former Guardian journalist Victoria Brittain gave a beautiful reading of Cuban national poet Nicolás Guillén’s “Tengo” (“I Have”). Rocío Maneiro, Venezuelan Ambassador, spoke on behalf of the ALBA countries in memory of Fidel. "Fidel is the son of Bolívar, the son of Jose Marti. He fought for social justice and independence for our lands. "The dream of friendship, solidarity and integration is being made reality by Latin American countries who believe a better world is possible," she said. Author Richard Gott paid tribute to Fidel's internationalism in Africa and his support for black civil rights movements in the US and his meetings with Malcom X and Angela Davis. Cuba’s support for Angola went beyond the military support, he said. “All my teachers when I was growing up were Cuban. Many doctors in Angola were Cuban. Fidel and Cuba helped our country in so many ways that we will forever be grateful for”. Richard Burgon MP gave a barnstorming speech which ended in a huge standing ovation. “I agree with Nelson Mandela's assessment of Fidel Castro, which is why I'm proud to be here tonight where we can reflect on Fidel’s Castro’s life, his contribution and living legacy. “When I hear Fidel Castro, I’ll always think of the doctors and nurses sent by Cuba to the poorest parts of our globe”, the Shadow Justice Secretary said. “In the last week… many politicians and pundits have attacked Cuba. These politicians and pundits should be thankful that they’ve not had to defend their public services in the face of the longest, cruellest, illegal economic blockade in world history,” he said. Diana Holland, CSC Chair, read out a range of messages from the online book of condolence, including messages from the British trade union movement including Len McCluskey, Unite general secretary, Dave Prentis, UNISON general secretary and Mick Cash, RMT general secretary, alongside a wide variety of messages of love and solidarity from all around the world. You can read the messages and sign here. “There is a world of work to be done. We need to challenge at every step of the way all the misinformation about Cuba in the British press. We need to redouble our efforts to stand in solidarity with Cuba and defend Cuban sovereignty.